Make your monitors work for you! Designed to produce tight bass and clear upper end, PreSonus Eris E8 active monitors feature Kevlar low-frequency transducers, low-mass silk-dome tweeters, responsive Class AB amplification, professional acoustic-adjustment controls, and more. With Eris E8s in front of you, you'll get accurate sound in your studio and out, since these fully featured bi-amplified powered monitors allow you to customize your sound to suit your style of music, as well as control the acoustic tuning of your space so you can simulate different listening environments. Gone are the days of listening to a mix in your car and through a second or third set of speakers. Helping you to work faster and more efficiently, the PreSonus Eris E8 brings together high-end components, useful controls, and smart design. Well-equipped to handle the lowest of lows and the highest of highs, these active monitors offer an extended low-frequency response, thanks to an 8-inch, Kevlar low-frequency transducer driven by a 75-Watt, Class AB power amplifier. The Eris E8's range goes from 35 Hz all the way to 22 kHz, courtesy of a 1.25-inch silk-dome, high-frequency tweeter. The tweeter is driven by a 65-Watt, Class AB amplifier and can deliver up to 105 dB SPL, peak. These monitors go above and beyond the call of duty to reproduce accurate, articulate sound. Because the Eris E8's low end is so vibrantly deep, you might not even need to use a subwoofer. It's easy to tailor the Eris E8s to suit your space and your type of music, so you can do all your mixing and testing in one studio, on one set of monitors. Using the Input Gain control, which determines the signal level before it reaches the power amp, you can gain-stage your overall system and set the levels for every part of the recording chain in order to get the best level of clean audio all the way through. You only need to do this once to get optimal sound quality every time you power on your Eris E8s. Three EQ controls in the monitor's Acoustic Tuning section -- High, Mid, and Low Cutoff -- provide the means to fine-tune the monitors to your space. You can also use these controls to approximate the sounds of different types of speakers, so you can hear what your mix might sound like on other systems. Likewise, a three-position Acoustic Space switch can boost your tone when you have no choice but to place the monitor near a wall or corner. What the Acoustic Space switch does is control a second-order, low shelving filter that cuts the level of all frequencies below 800 Hz by a specified amount (-2 or -4 dB) to compensate for the boundary bass boost that results from wall or corner placement. If you don't want to roll off those lows, you can set it to 0 dB. Hook up these powered studio monitors to just about any line-level source. The PreSonus Eris E8 sports balanced XLR, balanced 1/4-inch TRS, and unbalanced RCA line-level inputs. When both balanced connections are in use, the TRS input will supersede the XLR input; the RCA input is summed into the signal path. So that the Eris E8 speaker looks as sleek as it sounds, it has front-ported enclosures made of vinyl-laminated, medium-density fiberboard (MDF). Performance issues won't be a problem with Eris E8s, as PreSonus designed these monitors with enough protective measures to handle a variety of environmental mishaps that may occur. RF shielding protects against radio frequencies that could affect the signal; over-temperature protection helps avoid heat-related issues; current-output limiting prevents damage if there is ever a short circuit on the speaker terminals; and subsonic protection filters out extremely low-frequency vibrations that could interfere with the performance of the woofer. A soft startup prevents pops from damaging the speakers when you power them up. When you upgrade your studio's monitors to a set of PreSonus Eris E8s, you get a significant sound boost that's truly tailored to your music and your room. zZounds is an authorized dealer of PreSonus products. Presonus Warranty Presonus offers a one year warranty (parts and labor) on all new products. All non-new Presonus products are not covered by any warranty. The ultra-affordable PreSonus Eris E8 Monitor is designed to deliver a very accurate response with a tight bass and very clear upper end. That's what you need in a home studio. Thanks to well-designed Kevlar low frequency transducers, low-mass silk-dome tweeters, responsive Class AB amplification, and professional acoustic-adjustment controls, Eris delivers the goods. For an extended low-frequency response and a bit more muscle, step up to the Eris E8. With its 8-inch, Kevlar low-frequency transducer, driven by a 75 watt, Class AB power amplifier, it can range down to 35 Hz. The E8 monitor can reach all the way to 22 kHz, thanks to a 1.25-inch (32 mm), silk-dome, high-frequency tweeter. However, the E8's tweeter is driven by a heftier 65W, Class AB amplifier. With its extra juice, the E8 can deliver up to 105 dB SPL, peak. The Eris E8 speaker has front-ported enclosures made of vinyl-laminated, medium-density fiberboard (MDF). The Eris E8 powered studio monitor provides balanced XLR, balanced 1/4 in. TRS, and unbalanced RCA line-level inputs. When both balanced connections are in use, the TRS input will supersede the XLR input. The RCA input is summed into the signal path. With this selection, you'll have no problem hooking your Eris speakers up with virtually any line-level source. (If your signal source has unbalanced, 1/4" TS outputs, simply use a 1/4" -to-RCA adapter or adapter cable. Today's music producers deal with a wide variety of musical genres and often work in more than one location. It's easy to take your Eris speakers with you when you want to work in a different space. It's almost as easy to customize their sound for your room and type of music. The most basic control is the Input Gain, which determines the signal level before it reaches the power amp. This is part of gain-staging your overall system -- that is, setting the levels for every part of the recording chain in order to get the optimal level of clean audio all the way through. Once you've gain-staged your system, you can leave this control alone. The Eris E8 provides three EQ controls in its Acoustic Tuning section: High, Mid, and Low Cutoff. These controls enable you to fine-tune the monitors and even to broadly approximate the sounds of different types of speakers so you can hear what your mix might sound like, for instance, on a car stereo or portable radio. The Low control also is useful when using the E8 with a subwoofer. In addition to the Acoustic Tuning controls, Eris speakers offer a three-position Acoustic Space switch. This switch controls a second-order, low shelving filter that cuts the level of all frequencies below 800 Hz by a specified amount (-2 or -4 dB) to compensate for the boundary bass boost that occurs when the monitor is placed near a wall or corner. If you don't want to roll of those lows, set it to 0 dB. This combination of controls lets you create a linear response for accurate monitoring and enables you to simulate different listening environments, so you don't have to listen to mixes on your car, consumer computer speakers, and home stereo to check how the music sounds with different systems. Instead, you can adjust the Eris monitors' response and test your mixes without leaving your studio. No other monitors in this price class offer this degree of control. Any loudspeaker is subject to an assortment of environmental and performance problems, and Eris monitors offer protection from most common of these. RF shielding protects against radio frequencies that could be induced into the signal and become audible. (If you've ever heard a radio broadcast unexpectedly coming out of a guitar amp, that's the result of RF interference. Finally, Eris' power amplifiers have a soft startup so that you don't get damaging pops in the speakers when you power them up. By now, it should be clear that Eris-series speakers deliver a lot more than you would expect from a budget-priced studio monitors. As you expect from PreSonus, they use quality components, are well constructed, and deliver professional audio quality. They're lightweight and compact and look as professional as they sound. But what really sets them apart from comparably priced systems are user controls that allow you to tailor the speakers' response to your needs. 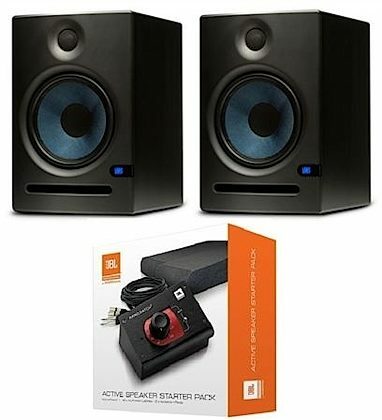 Overall: i have been shopping around for monitors to upgrade from my rockit 5s.. i had 1k to spend.. but every rep from every online and guitar store sent me in the direction of these beasts.. you dont need a sub.. and the stereo/mono imaging is insane... dont be fooled buy these monitors from zzounds now and you will be a happy camper! Overall: perfect for a bedroom producer wanting to hear the bass hit. Im more than happy with the volume of these things and would buy them again in a heartbeat.